I just got 2019 glenn tokens. Dont know if happy or sad. Made 9 calls and got nice stuff inc 128 caroll but then glenn did it again. He is almost double pink now but there are so many better scouts. Of course it was going to be Glenn! How could it have been anyone else! Heck, I'll take those Glenn tokens! As a F2P I am still upgrading. Do you mean uploading pictures to the forum? There should be some icons where you are typing your comments. Use them to attach the screenshots from your phone. Varies by phone...google your model number. 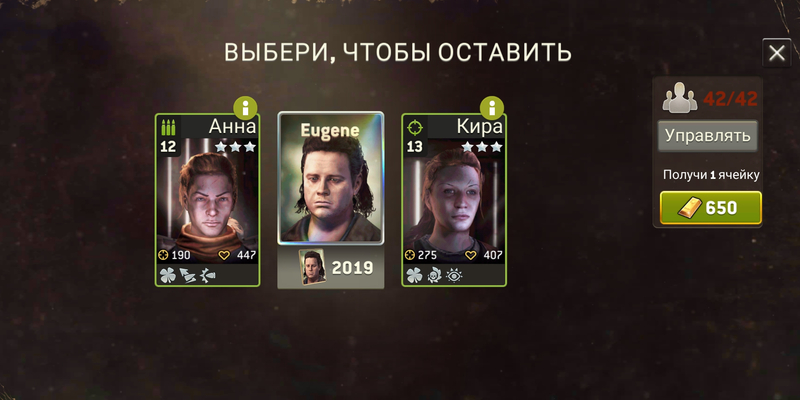 i wish i could trade you 2019 abe for those EUGENE!! I am lacking a PROPER scout. Glenn has to help out quite often. He always says "Why does it have to be me? ", but he takes his hospital time we'll to get the star(s). I'd be happy to get 2019 Glenn. All I got were 40s, of which one was a choice between Glenn and Jesus. I took Glenn. I seriously regret spurning 256 scout tokens. But I never will turn down Sasha tokens with promotion so close for her. hi, newbie question, i have been saving up some radio, would this be a good time to spend the radio on? @positive 2019 Eugenes, thats awesome..he’s one of the best hero bruiser after RGG & Morgan. How much radio u spent for that? > @positive 2019 Eugenes, thats awesome..he’s one of the best hero bruiser after RGG & Morgan. How much radio u spent for that? @TTsai The answer to that depends on you. Are you looking to unlock/improve a specific hero or two? If so, then this isn't a good call to do. Nearly all of the heroes are in play for this, so the chances of seeing that one or two you really want is pretty much nil. If you only want one or two, you're better off waiting (and saving up more phones) for those specific heroes to be featured in a double token call, that way you are much more likely to see the tokens you most want. If, on the other hand, you don't care what hero(es) you happen to turn up on a call, then it's an ok call to do. You are guaranteed a hero result, and a handful of more tokens than what is standard, for the price of a few more phones. And you have a minute chance at the big result. Abraham and Sasha would be your best bet to focus on first. So if I was you, I would wait for a double Abe or Sasha call. ok then, i'll save up the radios. which missions should i repeat doing? or which missions should i be farming? > which missions should i repeat doing? or which missions should i be farming? Since you're relatively new to the game, focus on story missions, and season missions. The low gas cost is a good way to play lots, and get some decent rewards in the process for minimal investment. Level up your own survivors first. Heroes have some unique abilities, but in terms of rarity (their stars), they grow much slower, and your own survivors will surpass them quickly. By the way, when you unlock a hero, they come with their own Survivor slot, so you dont actually ever have to worry about running out of spaces until you fill your roster with regular toons. how does one play this game in the beginning? because the gas cost is so high, and the wait time in the hospital gets crazy. any guide for a beginner like me?